No, this is not a movie review. But while I sit here watching UNC in the College World Series, everyone else on our beach trip is in the room near me watching The Bucket List. I haven't seen it yet, but I know the premise is a couple guys doing things on their "I gotta do this before I kick the bucket" list. Well, today I got one of those myself...I caught a big marlin while deep sea fishing off the outer banks coast. More pictures and such coming at some point, but for now I'll say it was about 85". We didn't take any chances of hurting it by trying to get it in the boat, and it's customary to release these things, so that's what we did. It probably took a full ten minutes or so to reel him in. He did jump a few times and was probably fifty to sixty pounds of fish. He sure pulled like he was a tractor, though. Angie, Matt, Alan, Jane, and Pavo were all on the trip, and everyone caught at least one fish and we got twelve total dolphin (no, not the mammal, the "mahi-mahi" as they are also known). The total weight of the dolphin was 70 pounds and we ate some of it tonight. Very good fish. Alan knows how to use a grill! 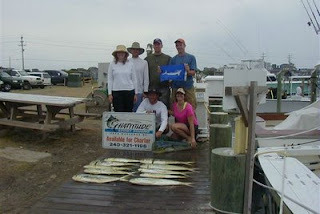 If you're ever looking for a deep sea fishing charter in Hatteras Village, I highly recommend Hattitude Sport Fishing. Our mate, Brian, was awesome. Our captain, RT, did a great job of finding us some fish on a day that was pretty dismal for most boats. The boat was also very nice and comfortable. It's definitely one of those things that everyone should do sometime! Well done! Save some of that yummy mahi for tacos. YES! I've got a "real" mount on order, but a copper one would be cool to put somewhere, too.